Christie responds to a scholarship solicitation by sending a $3 contribution and asking whether the school can make use of second hand clothing, ribbons, or rolls of music. 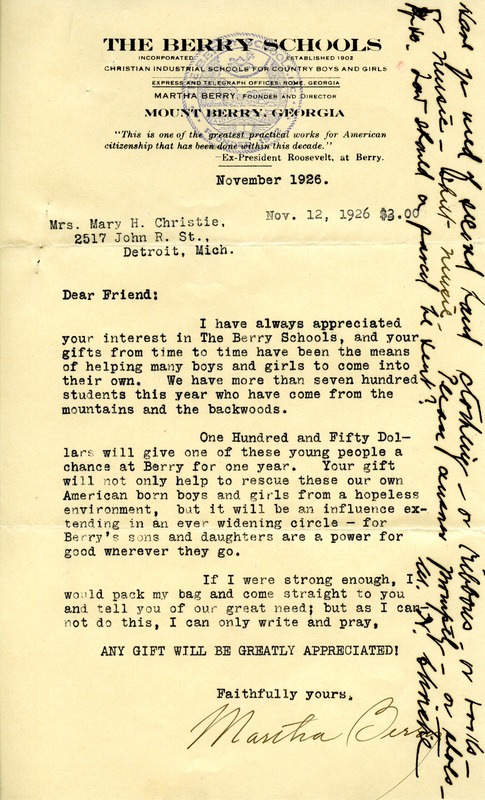 M. H. Christie, “Letter from Mary H. Christie.” Martha Berry Digital Archive. Eds. Schlitz, Stephanie A., Sherre Harrington, Lauren Grose, et al. Mount Berry: Berry College, 2011. accessed April 26, 2019, https://mbda.berry.edu/items/show/1151.